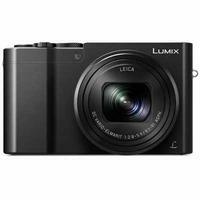 The Panasonic LUMIX DMC-TZ100 digital camera in black is the perfect pocket-sized travel companion for those looking for the freedom to explore and capture high-quality stills and videos as they go. This versatile compact camera is ready to capture images in a variety of environments, thanks to its versatile 10x Leica zoom lens (25-250mm) and powerful 1.0" sensor, which together deliver more detail, colour, and clarity in stunning 4K quality. Additional features include the Post Focus function, a Live View Finder, built-in pop-up flash and a 3.0" LCD.